The following text is from the Portrait and Biographical Album Woodford County, Illinois printed by Chapman Bros. of Chicago in 1889. HONORABLE. E. A. WILCOX, M. D., whose portrait is presented on the opposite page, is the oldest physician in Minonk in point of settlement, and the second oldest in Woodford County, Dr. James S. Whitmire taking precedence of him, and occupying the post of honor in that respect. He is one of the leading members of his profession in Northern Illinois, and since coming here has enjoyed an extensive practice, second to that of no other physician in this part of the State. In the prosecution of his profession he has shown himself to be a businessman on no ordinary ability, and has accumulated a large amount of property, thus placing himself among the men of wealth and influence in his community. His time has not altogether been devoted to his calling, for a man of his executive capacity is demanded in public life, and he has served with distinction in various county and city offices, and has been a member of the State Assembly. The Doctor is a native of Pennsylvania, born in the town of Wattsburg, Erie County, September 8, 1830, a son of Levi and Nancy (Rogers) Wilcox, natives respectively of Haddam, Connecticut, and Columbiana County, Ohio. The Wilcox's are of Scotch ancestry, and for many generations have been represented in New England, where they settled in early Colonial times. His grandfather, Levi Wilcox, was a farmer in Connecticut, and the father of our subject was reared on the old homestead, amid the pleasant scenes of his New England birthplace. He was a studious, thoughtful lad, and educated himself for the medical profession, for which his talents seemed peculiarly adapted. He moved to Ohio, married there, and subsequently practiced his profession in Tuscarawas County; that State, being one of its pioneer physicians. From New Philadelphia, the county seat of that county, he came to Illinois about 1837, and located in Lacon, Marshall County, as one of the first physicians of that town, and was there actively engaged in his profession the remainder of this life. He became very prominent, not only as a doctor, but as a public official, and his death, of cholera, June 4, 1851, at the age of fifty-one years, was a severe blow to the county, which then lost of one of its most influential and valuable citizens. He was a gentleman of much culture, and of a calm, philosophical temperament and got all the enjoyment out of life possible, living well, and having the benefit of his money as he went along. He had good financial ability, and accumulated an estate of over $10,000. He was a Whig in politics, a leading member of his party, and he served one term as County Treasurer of Marshall County. He was a member in good standing of the Methodist Episcopal Church. The mother of our subject was a daughter of Alexander Rogers, and had seven brothers: Dr. Thomas P. Rogers of Bloomington, Illinois; John Rogers, a farmer, of Marshall County; Samuel Rogers, a retired farmer of Woodford County, now living in Minonk; Dr. R. B. Rogers, of Lacon; Dr. David Rogers, of Missouri; Dr. Alexander Rogers, of Ohio; and George Rogers, of Oregon. She survived her husband many years, her death finally occurring in March, 1888, at the home of our subject, at the advanced age of eight-four years. Six children were born of her marriage: Edward A., our subject; Sophronia, who married Ezra Warren, and died in Tiskilwa, Illinois; Alfred R., an officer in the late war, who died in the service; Cynthia, who married James D. Verna, and died in Lacon, Illinois; Elizabeth, the wife of Henry C. Dent, of Gainesville, Texas; Levi S., a resident of Champaign, and Collection of Internal Revenue for the Second District of Illinois. Alfred R. was a member of Company H, 11th Illinois Infantry, First Lieutenant of his company. He was wounded at Ft. Donelson, and died at Minonk one month later, and thus a gallant officer was lost to the cause. Our subject was but eight years old when the family came to Illinois and he laid the basis of a sound education at Mt. Morris. He began the study of medicine under the instruction of his father and of his uncle, Dr. R. B. Rogers, and in 1857 was graduated with honors from Rush Medical College, with a good theoretical knowledge of medicine in its various branches. He opened an office at Lacon, but after practicing there a year came to Minonk and has since carried on his profession here, and has raised himself to the first rank among the physicians of Woodford County, as a practitioner of more than ordinary skill and intelligence, who has met with great success in the treatment of difficult cases. He has also been successful from a financial standpoint, his ability in regard to money matters being as conspicuous as it is in the exercise of his profession. He is the owner of 800 acres of land in Woodford and adjoining counties, and over 1,400 acres of land in other States, besides having other valuable property in Minonk. The Doctor has been twice married. He first led to the altar, June 23, 1857, Miss Carrie Mathis, a daughter of Caleb Mathis, of Putnam County, Illinois. She was a native of Illinois, having been born at Urbana, Champaign County, December 12, 1832, and died in Minonk, March 11, 1877, leaving her husband and children to mourn the loss of one, who in every respect filled the perfect measure of wife, mother, friend. The following is recorded to the seven children born to our subject of that marriage: Elsie S. is the wife of William Haggard, a business manager of La Porte, Indiana; Carrie E. is the wife of H. C. Forney, of Minonk; Alfred R. is a dentist in Minonk; Fred W., a graduate of Rush Medical College, is a physician in Minonk; Frank T. is a student at Rush Medical College; Hattie and Mattie, twins, are pupils at the Wesleyan University in Bloomington. The Doctor's marriage to his present wife, formerly Miss Victoria Boyle, took place at the home of her father in Ox Bow, Putnam County, Illinois, July 17, 1878. She was born in Putnam County, Illinois, April 29, 1853, and is a daughter of David Boyle, a retired farmer living in Wichita, Kansas. Five children have been born of this union-Edna C., Barnard A., Lottie and Logan, twins. Josie is deceased. Our subject has not only distinguished himself in the medical world, but in public life, where his name is widely known and honored as that of a wise, able and progressive statesman, who has worked zealously for the highest interests of the State, county, and township, ungoverned by personal aims or party considerations. 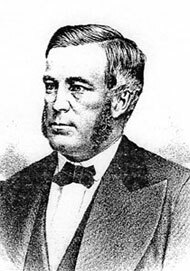 He represented his district, which then included Woodford, Marshall, and Putnam counties, in the State Senate three sessions, a period of four years, from 1872 to 1876. This fact illustrates his genuine popularity, the hold that he has upon the hearts of the people, and his great influence when it is considered that these counties are largely Democratic, yet he, a sound Republican, was elected State Senator by an unusually large majority, and that no Republican has represented the district from that date. As mayor of Minonk for three terms he has greatly advanced its interests in every direction, and has done much to bring about its present prosperity and high standing. He is a leader in the Republican Party and in this section of the country, a prominent member of the State Central Committee, having served three terms, and once as a member at large. He is a member of the State Medical Association of the Northwest, and of the Woodford County medical societies.